It's important to quickly identify how you can reduce the time and resource burden on your corporation when choosing a disbursement method. Learn how to stop overspending on funds disbursement and discover new ways to start saving money. 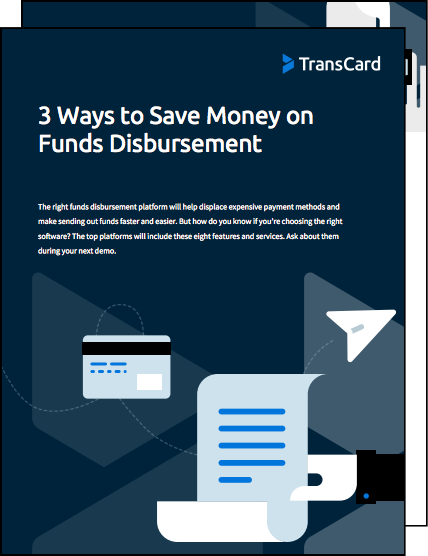 Download our overview, "3 Ways to Save Money on Funds Disbursement". At TransCard, we believe payments should be personalized for recipients and stress-free for businesses. Everyone receiving payments should have the power to decide how they accept their funds and every company should work with a platform that’s up to date with the latest regulations and compliance requirements. Every financial institution, business, and gig economy leader should have the products and platforms to make payments easy for their vendors, customers, and employees. TransCard revolves on these tenets, embracing emerging technology and re-defining payment solutions for the entire industry. Our SaaS funds disbursement and management platform is the only platform on the market to take the full burden of escheatment and PCI compliance off payers. It’s the only platform to focus on consumer choice, empowering payees to choose how they receive their funds.